The Broke and the Bookish : Kelly reviews "The Adoration of Jenna Fox"
Jenna Fox has awoken after a year of being in a coma and doesn't know who she is. She has no memory of her past life in Boston, who her friends were, what happened during her horrific accident, and doesn't know why she woke up in California virtually hidden away by her family. Through videos, pictures, and stories, she slowly begins to remember herself, but can't always tell fact from fiction. Are these things she's imagining her own made up fantasies, or are they actually memories from her own life? As she tries desperately to remember herself and explore her past, she notices that her parents are hiding more and more secrets. The book is set in the near future and poses a lot of scientific question and theories that could actually come to being one day. I won't giveaway the plot twist, but it's pretty interesting to think about and see how Jenna and her family deal with the ethical struggles it raises. The entire book isn't very cheerful, it's mostly desperate in tone (the desperation of Jenna's parent's, Jenna's desperation to find out who she is and also her desperation to reconnect with her cold, distant grandmother). The big question you are left with is: what would YOU do to save a human life, no matter the consequences? 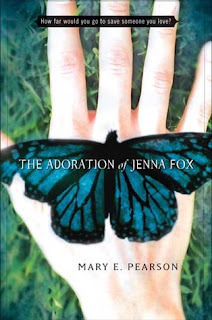 I really enjoyed The Adoration of Jenna Fox overall; it was intriguing and had an interesting buildup. Still, I feel that it needed a little extra kick that would've made it complete. Jenna is a nice main character, it's easy to sympathize with her and be invested in her life and issues. 3.5 stars overall! From what I can remember about this book, is the tone of Jenna in general. She seemed robotic to me. I have given this book a higher rating just because of its overall ingenuous subject matter. I felt pretty much the same way! I was actually incredibly interested in the beginning trying to figure out what happened to Jenna but once the reveal came, I felt like it was kind of anticlimactic after that. I was just waiting for that one kick too! OH! This is my kind of book! I need to track this down ASAP! I loved this. So great for anyone who's got a philosophical or biological mind. It was so fun thinking of what makes someone a person and how far would you go for your loved ones plus the characters and story are great! Sounds quite similar to Before I Go To Sleep by S J Watson. I really like amnesia \ loss of memory themes in books as it adds that extra question; is it fact or fiction. It's similar to paranormal \ psychological books like the Turn of the Screw in that sense; you cannot tell what is real. Great review; I will add this to my wish list.